The Zygopetalum orchid genus is unusual in having its tepals fused at the base, so that sepals fuse to the adjacent petals. The fowers are quite showy, and they are very easy to grow. 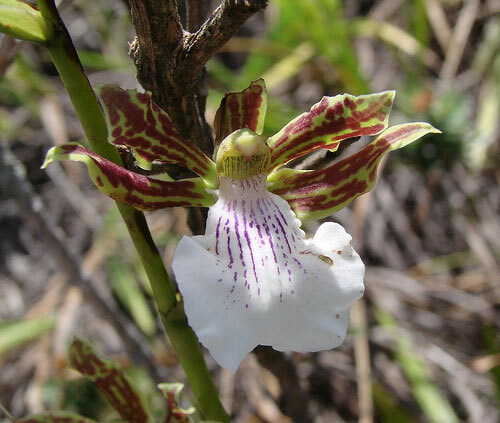 Most species are epiphytes, though Zygopetalum triste grows as a terrestrial orchid or lithophyte. Most species originate in Brazil. They like high light, 3000-4000 footcandles, similar to Cattleya. If it's getting as much light as it can take, the leaves will become paler and slightly yellowish. More light will then cause sunburn. If adjusting the plant to higher light, acclimate it gradually. Intermediate-to-warm temperatures, with daytime temperatures in the 70's Fahrenheit (21-27C), and a nighttime drop of 10-15°F (6-8C), are ideal. They are quite tolerant of wider temperature ranges, though: they'll deal with temperatures of 90°F (32C) fairly well, and are okay down to just above freezing. This makes it relatively easy to grow them outdoors for much of the year in most places. They'll do much better with 60-70% humidity than they would if the air was too dry. They don't like to be pot bound, so repot when they start to fill the available space. I usually use plastic pots. I generally repot every two years or so, usually shortly after blooming. A mix of fine fir bark and rockwool makes a good potting mix for these orchids. If growing these orchids under lights, you can reduce the day length by a few hours to trigger blooming.